Scott Young has resigned as manager of Irish Premiership club Glentoran after the shock Irish Cup defeat by Amateur League side Newington Youth Club. It was reported that Young had wanted to quit immediately after Saturday's headline-grabbing 1-0 loss at the Oval. He was asked to reflect on his position overnight, but on Sunday the club confirmed Young had stood down. Director of Football Roy Coyle has been put in temporary charge of the team, who face Ballymena United on Tuesday. 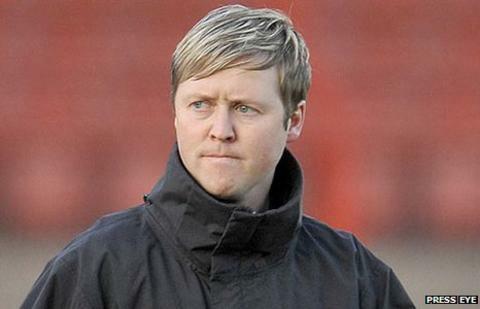 Young, a talented midfield player for the Glens, took over as manager in April 2010 following the resignation of Alan McDonald. During his time in charge, Glentoran won the League Cup and the County Antrim Shield. Glentoran chairman Terence Brannigan described Young's departure as a sad day for the club. "I accepted his resignation with a heavy heart because I was a supporter of Scott's," he said. "He was passionate about managing the club and gave it his all. "He conducted himself with great dignity and I felt badly for him. "The lad has been at the club for 14 years as a player, coach and manager. "Everyone at the club was disappointed with the Newington result. "Scott was upset and said at that point he believed he should resign. "I advised him not to do something like that in haste and to let emotions calm. "We arranged to meet on Sunday and he was still convinced that he should resign." Former Lisburn Distillery boss Paul Kirk, Roy Walker, Eddie Patterson and Marty Quinn are among the possible contenders for the job.